HIGHLANDS– Highlands Junior School principal Steve Herring recently addressed the issue of the new HJS campus during a Question and Answer session. What is your mindset right now as the district tries to decide when the new campus will open? We continue to look forward to being in our new building and want to work with the contractor to ensure that the building is in a safe, orderly, and welcoming condition for the children and staff members. While we had hoped to be in the building as soon as possible, we dont want to sacrifice quality for the sake of the schedule. What plans are you guys making as a staff for either a January opening or remaining in the current building? Plans will be made as soon as an occupancy date is determined. How is the situation affecting teachers? Students? Because of the uncertainty about the move-in date, we have not discussed this with our students. Our teachers have been told that the move is on hold at the present. As always, they are focused on helping our students to succeed in school. How much are students and teachers looking forward to the new campus? We are excited about the new campus and the improved setting that it will offer. In the meantime, we continue to focus on teaching and learning in the current building until our new one is completed. What will be the challenges of moving into the new campus? What will be the advantages? Challenges will include packing and unpacking supplies and materials and setting up classrooms and other areas of the building. Many of our staff will give of their personal time to ensure that the new building is organized in a manner that is best for students. What message would you like to send right now to parents? We will work closely with the contractor to determine a move-in schedule that will provide for a completed building and will be the least distraction from the instructional program. North Harris Montgomery Community College District annually awards five local businesses, one in each of its college districts, the prestigious Small Business of the Year at an awards banquet. 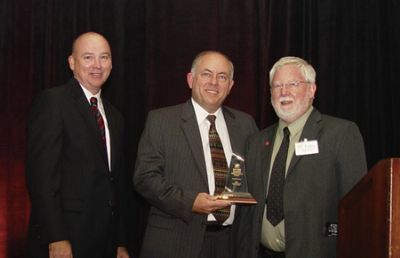 In the North Harris College service area, the award was made to publisher Gilbert Hoffman and the Northeast News. 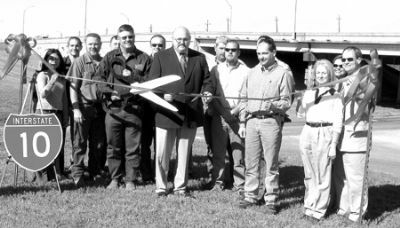 This is one of four newspapers published by Grafikpress Newspapers, including the Highlands Star-Crosby Courier and Barbers Hill-Dayton Press.. The award is based on community service and exemplary business practices, job growth, and recommendations from community leaders. A gala evening attended by over 350 persons at the Crowne Plaza Hotel Greenspoint was the setting for the 21st annual awards ceremony, sponsored by the Small Business Development Council of North Harris Montgomery Community College District. Tomball College, SERVPRO OF SPRING/TOMBALL, Kathleen & Anthony Scott. The Small Business Development Center is under the direction of Sal Mira, who spoke about the logistics of the awards and the banquet, and thanked those who helped. This included the title sponsor, Capital One, and other sponsors including Amegy Bank, UHY Advisors, Harry Bucalo, CenterPoint Energy, Greater Conroe Economic DC, Greespoint District, Joiner Partnership, Kingwood College, Newtek Business Services, Schubot Law Firm, Schulte Building Systems, Sterling Bank, and Resource Protection Mgmt. Music for the evening was presented by the Ace Jazz Orchestra. Mira explained that the process to choose the finalists had started with nominations for 180 firms, which had been narrowed to 15 businesses. These included Boullion Graphics, Perry Pools & Spas, Schubot Law Firm, Frost Construction Company, Lets Mechanical, The Filter Man Ltd., Biogime International, Daniel Office Products, Homewatch CareGivers, Magoos PrintShop, NorthEast News, Vest Rea & Associates, Chaparral Management Company, Schulte Building Systems, and SERVPRO of Spring/Tomball. These firms had been judged by a committee of the SMDC advisory council, and judged on several submissions and letters of recommendation. Each of the 15 finalists participated in a video interview that was presented during the evenings ceremony. They had one minute to talk about their company and the reasons for its success, and the importance of the award to their business. Also, after the awards were announced in each category, the winner was given an opportunity to address the audience with additional thoughts. Other speakers during the evening included Jerry Lowry of the Greenspoint district, Paul Davidson regional president of Capital One, and Ray Laughter, Vice Chancellor of the NHMCCD. The 15 finalists also had booths set up in the prefunction area to display details about their businesses. Now that the holidays are here, you’re probably looking around for the right gifts for your loved ones. Of course, as you know, it’s not always easy to find gifts that are both meaningful and useful. This year, why not add financial gifts to your shopping list? *Contributions to Section 529 plans – If you have a child (or grandchild) that will be headed off to college in a few years, you may want to contribute to a Section 529 college savings plan. Your earnings and withdrawals will be exempt from federal taxes as long as the money goes toward paying college costs. There may be additional tax benefits to those who participate in their own state’s plan. Also, you can contribute generous amounts to your savings plan. Plus, you can change beneficiaries; if you’ve been putting money in a Section 529 plan for your child or grandchild, and he or she decides to forego college, you can transfer the money to another family member. *Contributions to an IRA – If you know a loved one has an IRA, consider making a contribution. Many people don’t fully fund their IRA each year – so any help you can give toward that goal will be important. *Savings Bonds – They may sound old-fashioned and stodgy, but U.S. Savings Bonds can still make nice financial gifts, especially for young people who can use the money in the future. Among the most popular savings bonds are Series EE Bonds, which can be purchased in denominations ranging from $50 (or $25.00 for Electronic EE Bonds) to $10,000. Paper EE Bonds are sold at half their face amount and will increase in value until they are cashed in or reach final maturity in 30 years. Electronic EE Bonds are sold at face value and reach maturity immediately. You can learn more about Series EE Bonds and TIPS, or even purchase them directly, from the Treasury Department’s web site devoted to savings bonds: www.savingsbonds.gov. A financial gift may not be traditional, but it can have a big impact on the recipient’s life – and it won’t be forgotten after the holidays. The other day, a good friend of mine came to me because she was freaking out. She had applied for a major international scholarship for graduate school but had not received a callback for the interview process. This was the second year in a row that she had tried; she did not want it to be the second year in a row that she failed. Unfortunately, I think I provided little if any consolation. The truth, I told her, is that she probably shouldnt apply to anything if she isnt prepared to be denied. My nonchalance doesnt come from indifference, but from experience. As a sophomore in high school, I tried out for the Honor Corps on my dance squad. I spent hours choreographing and practicing my thirty-second tryout routine, and even though I was terrified to be watched and scrutinized by the judges — not to mention by my whole squad — I really thought I put my whole heart and soul into my performance that day. But I didnt make the Honor Corps. I spent hours crying that night, and I moped for the rest of the week. A friend who did get into the elite group of dancers tried to comfort me, saying that there was always next year. I thought that was easy for her to say. She had tried out on a lark! She hadnt invested the same amount of time, energy, or hope that I had. And that was the key. What I learned from her and from those tryouts was that caring is good, because thats what makes you try your best, but caring too much only sets you up to be disappointed. A year later, that very same friend urged me to try out again. She helped me choreograph and practice my tryout piece — which was a lot better than the one I had done by myself — and when I auditioned, I simply danced the best I could. And I made the Honor Corps. I would like to say that I learned the lesson instantly and irreversibly, but like most things, it would take some time to fully sink in. A couple years later, as a freshman in college, I applied to be a Resident Assistant, and when I didnt get the job, I was heartbroken. Everyoneand I mean everyonethought I was going to get it, so the shock probably hit me worse than the disappointment. But everything turned out for the best, because I did a number of things the next year that I would not have been able to do as an RA, including working at the Carnegie Museum of Art and traveling to New York City to see The Gates in Central Park. Now, I know better than to pin all my hopes on one thing. When I apply to jobs or submit stories for publication, I adopt the motto hope for the best, but prepare for the worst. And because I believe that things happen for a reason, I trust that the worst is actually leading me to a better path. I came to this conclusion the way I come to all things: the hard way. And my friend may have to do the same with this scholarship. But after spending hours helping her prepare — editing essays, doing mock interviews, giving pep talks — I can sincerely say that she deserves this opportunity, and I hope she learns this particular lesson later, rather than now. Houston fire fighters found the body of Rodney Hodges, 56, during an in inspection of this Huffman home on Broad Ripple Drive, which caught fire on Nov. 15. The home was in the Lakewood Heights subdivision. A spokesperson for the Harris County Medical Examiners office said that Hodges cause of death is still pending. The cause of the fire is also under investigation. The communities of Highlands and Baytown mourn the passing of Lisa Urban, well known in these towns for her dedication to civic organizations and selfless community service. She was also a member of St. Jude Church in Highlands, with many friends there. Lisa Hood Urban, 51, passed through this life to be with her eternal Father on Nov. 17, after contracting a rare pneumonia. Lisa was a wonderful companion and best friend to her husband and confidant Johnny Urban. She was always the doting and loving mother to her two sons, John Paul Urban III and Matthew Urban. Lisa was preceded in death by her father, M. L. Hood; father-in-law, John Paul Urban, Sr.; and loving sister-in-law, Teresa Urban Mosier. Lisa is also survived by her parents, Betty Joe and David Boothe; sisters and bothers-in-law, Rita and Greg Singletary and Dee Anne and Chris Navarre; and brother and sister-in-law, Greg and Debbie Boothe. Lisa had a loving relationship with her mother-in-law Fern Urban, her brothers-in-law and their wives, nieces, nephews, great nephews, and great niece. Lisa was born in Houston, Texas on May 20, 1956. 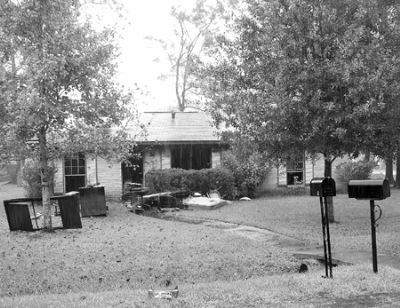 Her family moved to Baytown, Texas in 1965. Lisa attended Baytown schools and quickly became a favorite to many friends. Her warm, sweet smile, quick wit and the ability to share a kind word were her trademarks. After graduating Ross S. Sterling in 1974, Lisa attended at Lee College. She transferred to Southwest Texas University and then to The University of Texas at Austin. While at Southwest, Lisa met Johnny and a true friendship was formed and cemented in love. This love carried them through their thirty years of marriage. Lisa and Johnny had a wonderful life together, they were truly blessed. They traveled about the world, laughing and loving along the way. Their mutual respect was evident everyday of their lives together and was truly a partnership made in Heaven. Their partnership was further sealed when they were blessed with the birth of their two sons. Lisa and Johnny reared their boys in a Christian way, passing on their morals that are evident in these young men today. Lisa was a devout Catholic and member of St. Jude Catholic Church in Highlands, giving thanks to God for even the smallest accomplishments in her life. After graduating from the University of Texas with honors in accounting, she became a C.P.A. and started her career in Houston at a large accounting firm. 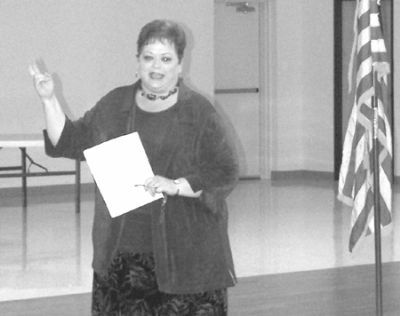 In the mid 1980s, she came to Baytown, where she started her own accounting firm. Later, along with Mark Mendelovitz and Ed Altemus, they formed the accounting firm of Mendelovitz, Altemus, and Urban, C.P.As. 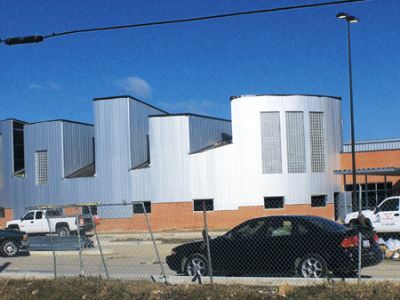 The company later became Mendelovitz Urban, and Associates PC, currently under the management of Lisa and co-owner and longtime partner Debbie Busch. She thought of her employees as family; she truly loved each and everyone of them. After starting her business Lisa began her community service to Baytown. She served on numerous committees and organizations such as Rotary Club of Baytown as Treasurer, United Way of Baytown, Lakewood Civic Association, Friends of Lee College Foundation board member, the first female chairperson for the Chamber of Commerce of Baytown, co-chairperson for the Regional Urban Design Assistant Team, Chairwomen of Baytowns Long-Range Planning Commission and selected Citizen of the Year in 1996 for her tireless efforts. Lisa was diagnosed in January 2006 with Adenocarcinoma Lung Cancer. She never smoked and was never subjected to second hand smoke. Lisa and Johnny began their quest to learn as much about this cancer as possible. Their research led her to The Cancer Treatment Centers of America in Tulsa, Oklahoma, where her doctors and nurses grew to love her quickly. She was given the best care available and was conquering the cancer when she contracted pneumonia. Lisa was amazing throughout her illness, never complaining. Lisa was a staunch believer in education. After she was diagnosed with cancer she expressed her desire to set up an endowment with the University of Texas. As was Lisas fashion, this goal was met this past year. Her family received friends Nov. 19, from 5 until 9 p.m. with a rosary at 7:30 p.m. at Navarre Funeral Home. A funeral Mass was Nov. 20, at 3 p.m. at St John Catholic Church, 800 W. Baker Rd, Baytown, Texas 77521 with Rev. John Zebelskas officiating. Following the mass all family and friends were invited to attend a celebration of Lisas life at the Goose Creek Country Club, 5000 Country Club Dr., Baytown, Texas 77521. At Lisas request her body will be cremated afterwards. Pallbearers were Charles Cha Cha Conder, Tim Dodson, Dan Peters, Frank Williams, Calvin Mundinger and Ron Thompson. Honorary pallbearers will be Sherman Glass and Keith Fulton. Lisas family would like to thank all of their friends and family who have been through this journey with them. Lisa loved all of you and cherished your friendships. 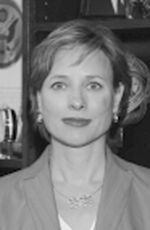 Because of Lisas belief in higher education, contributions may be made in lieu of flowers in her memory to the Lee College Foundation, Attn: Robert Wright, P. O. Box 818, Baytown, Texas 77522-0818. 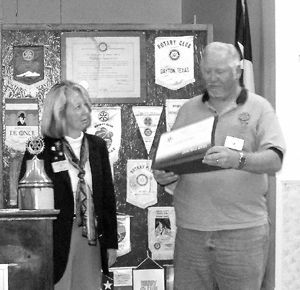 Past District Governor Suzi Howe presents an award certificate to Johnny Gaeke, past president of the Highlands Rotary Club. The Award announced that the Highlands Club, in 2006-2007, raised more money per capita for the international Rotary Foundation than any of the 57 clubs in the district. The amount of $383.79 per member was very close to the record amount for the whole world, which was about $400 by a club in Brazil. The Rotary Foundation funds humanitarian projects worldwide. CROSBY– Last week, during the Crosby-Huffman Chamber of Commerces monthly membership luncheon Board of Director elections were held. The six positions were filled by: Juli Hain, Brothers Commercial Carpet Cleaning; Justin Brady, Edward Jones Investments; John Sparks, Sparks Insurance Agency; Bob Ward, Bobs Computers; Don Cox, Century 21 Lifechangers and Julie Gilbert, AAA Home Loans. Also during the luncheon Valerie Coleman, of the Small Business Administration spoke about the programs designed to help small businesses grow and prosper.